Deuteronomy 6:1-9 — First love God with all your heart; the foundation of the First Great Commandment. Ruth 1:1-18— Ruth decides to trust God and look after Naomi. A choice to do what is right. Mark 12:28-34 — the Great Commandment, love God, love others. Unselfishness the guiding principle of the kingdom of God. Hebrews 9:11-14 — Love enabled by the cleansing power of the blood of Christ. Christ’s sacrifice changes us inwardly in a way the blood of calves and goats never could. 1-2 These are the commands, decrees and laws the Lord your God directed me to teach you to observe in the land that you are crossing the Jordan to possess, so that you, your children and their children after them may fear the Lord your God as long as you live by keeping all his decrees and commands that I give you, and so that you may enjoy long life. “Be careful to obey” — needs to be understood in terms of the heart and soul and passion of v.5, see note to vv. 6-8 below. “The Lord is one” — distinctive among other tribes and nations who worshipped, and attempted to placate, various deities who were related to the prevailing threats and needs of life. Scripture is progressive revelation, and “The Lord is one” remains a truth that overarches God revealing Himself in His Son, and then the awareness of the third Person, the Holy Spirit of God, guiding and empowering the Early Church and our mission today. “Hear, O Israel” — recited by Jews in the synagogue and often daily as well, this Shema (Hebrew for ‘hear’) passage is a foundational confession of faith, as the Nicene Creed has become in the Church of England. “Love the Lord” — ‘love’ in English has a broad range of meanings. This has the specific sense of ‘adore, revere, be committed to’ in the way people show their devotion to a popular monarch, like Trooping the Colour in London every June. 6-8 These commandments that I give you today are to be on your hearts. Impress them on your children. Talk about them when you sit at home and when you walk along the road, when you lie down and when you get up. Tie them as symbols on your hands and bind them on your foreheads. “0n your hearts… foreheads” — the sense of verse 6 was lost on some Jewish sects who in religious zeal tied a small box containing the text over their heads. This is what we all tend to do: try to turn a heart relationship into a set of religious rules and routines which we find easier to control. But the Lord simply wants our hearts, and when He has our heart, that will be evident enough. 1-2 In the days when the judges ruled, there was a famine in the land. So a man from Bethlehem in Judah, together with his wife and two sons, went to live for a while in the country of Moab. The man’s name was Elimelek, his wife’s name was Naomi, and the names of his two sons were Mahlon and Kilion. They were Ephrathites from Bethlehem, Judah. And they went to Moab and lived there. “When the judges ruled” – following Joshua and preceding Saul and David, probably around 1100 BC. “Mahlon and Kilion” – both names descriptive of a weak constitution. 3-5 Now Elimelek, Naomi’s husband, died, and she was left with her two sons. They married Moabite women, one named Orpah and the other Ruth. After they had lived there about ten years, both Mahlon and Kilion also died, and Naomi was left without her two sons and her husband. “Married Moabite women” – not forbidden although classed as outsiders – there was a 10-generation (male) ban on “entering the assembly of the Lord”. However, marriage and continuation of the family line was socially essential. 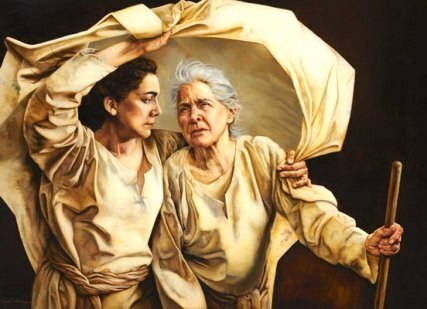 “Naomi was left” – the plight of Ruth’s mother-in-law is set out early in the story. Life could be very hard and vulnerable for an unsupported widow in that culture. 6-7 When Naomi heard in Moab that the Lord had come to the aid of his people by providing food for them, she and her daughters-in-law prepared to return home from there. With her two daughters-in-law she left the place where she had been living and set out on the road that would take them back to the land of Judah. “The Lord had come to the aid of His people” – this story emphasises the Lord’s sovereignty over events. “Show you kindness” – Naomi had blessed her daughters-in-law with God’s hesēd, meaning the covenant, loyal love of God, although the daughters-in-law were not Israelites and in a foreign country. Naomi sees her difficult circumstances, wrongly, as the Lord’s enmity or discipline of her – as we often do. The book as a whole tells a different story of God’s gracious provision. “Clung to her” – dabaq, a strong word, also used of a man being joined to his wife, Genesis 2:24, or remaining faithful to the Lord, Deut 4:4, Joshua 10:20; Josh 22:5. 16 But Ruth replied, “Don’t urge me to leave you or to turn back from you. Where you go I will go, and where you stay I will stay. Your people will be my people and your God, my God. “Your God my God” – Ruth probably grew up worshipping the Moabite god Chemosh. 17-18 Where you die I will die, and there I will be buried. May the Lord deal with me, be it ever so severely, if even death separates you and me.” When Naomi realized that Ruth was determined to go with her, she stopped urging her. “May the Lord” – Ruth invokes the name of Yahweh for the first time, showing her commitment to Naomi and the Lord, with no other prospects in view. She is embracing uncertainty, leaving kinspeople and familiarity to go where she has no family and friends, as an outsider. IN PRACTICE Ruth and Naomi walk us through what it means to return God’s love by trusting Him and choosing His way in our relationships with others. They faced an uncertain future as women in a man’s world, their menfolk having been taken from them. Do they blame God, or trust Him? Do they do what gives them most opportunity, or choose to do what is right? Life and its pressures and choices hasn’t changed in three thousand years, except that we have many more choices we can make, and many more options for self-determination rather than seeking God’s best and trusting Him in it. We have too much practice in making easy but low-value choices, and we need to work up our skills in making high-value and lasting ones — seeking God and trusting Him for His way. QUESTION Trusting God, doing what is right by Him, making high value choices is difficult. Who can share this with you, and encourage you? “One of the teachers of the law” – until now, in Mark, they have been hostile; this was probably a Pharisee, but a friendly and teachable one. 29 “The most important one,” answered Jesus, “is this: ‘Hear, O Israel: The Lord our God, the Lord is one. “The second is this” – Jesus puts two sayings together (see For Further Study note below) that were widely separated in the law, and so not expected to be combined. The first summarises commandments 1-4 about loving God wholeheartedly, the second summarises commandments 5-10 about moral responsibility and treating others well. His point is that they cannot be separated. God, who loves us, expects us to return His love by putting Him first and also by honouring others, loving them as He does. “You are right” – this particular scribe had understood that God’s overriding characteristic was mercy. Without the accompaniment of just and merciful behaviour, without which the ceremonial was meaningless. “Not far from the kingdom” – the scribe had the right priorities, but entering the kingdom would require him to recognise and speak out Jesus as being the Son of God, (who would shortly die in his place as a sacrifice for his sins). For further study: The Great Commandment unfolds, Deut. 6:46; Leviticus 19:18; Matthew 5:43; Matthew 22:36-40; Luke 10:27; Romans 13:9; Galatians 5:14. This man had grasped the teaching and understood the way it fits together. He knew the priorities – a lack of moral compass and concern for others cancels out any good religious intentions we can perform. First things first, and with God, that is always mercy! The second teaching here is about the spirit of the law versus the legalism of the law. Jesus upholds the broad intention of the law by being the fulfilment of the law. He shows what it looks like to know God’s love, and so to be provoked into returning it in devotion to God, that results in having a heart of mercy and generosity to others. By contrast, the Jewish teachers and scribes majored on the fine details of observance, where their response to God had become formulaic rather than feeling. We can’t reduce the teaching of Jesus to a formula; either it is heartfelt or it is reduced to head-knowledge. To change the world around us – being bringers of the kingdom of God – must start with us having a demonstrable heart change. We can’t give what we haven’t got. QUESTION How can we, as the Church representing Jesus, be more effective at showing His transforming love to the world, rather reducing it to the kind of rituals and regulations which Jesus so clearly derided? 11 But when Christ came as high priest of the good things that are now already here, He went through the greater and more perfect tabernacle that is not made with human hands, that is to say, is not a part of this creation. “Greater… perfect tabernacle” – a comparison between the tent that preceded the temple with its hammered gold lamp stand for seven lamps and its consecrated bread, and the ‘heavenly tent’ around God’s presence. The man-made one was a poor shadow of the real thing which Christ entered to take his high priestly seat. 12-13 He did not enter by means of the blood of goats and calves; but he entered the Most Holy Place once for all by his own blood, thus obtaining eternal redemption. The blood of goats and bulls and the ashes of a heifer sprinkled on those who are ceremonially unclean sanctify them so that they are outwardly clean. “Once for all” – a comparison between the repeated sacrifices of the Levitical priest, each of which amounted to a partial remedy for sin, and Christ’s sinless sacrifice, final, effective and unrepeatable. “How much more” – an argument from less to greater. The comparison emphasises the power of remembering, enacting and declaring what Christ’s blood has done for us. The balance between these actions varies across Christian traditions. IN PRACTICE The flesh nature — how we behave naturally as humankind — is inherently selfish and self-protective, and therefore not disposed to be generous to others. We live in competition, not collaboration. Loving others is optional, depending on what we feel – because we readily store up resentments accumulated by emotional collisions with others. Coming to Christ and having a personal relationship with God brings the Holy Spirit’s dynamic to counteract and change this self-centred flesh nature. We have hurt God by our selfishness and rebellion, but He has forgiven us — massively. This is the work of the blood of Christ, not only spiritual forgiveness for sin, but emotional cleansing of conscience from the effect of sin. Now we can think and act differently, with a generosity of spirit towards others. It is still a choice — we need to constantly be reminded how Christ’s blood has cleansed us — but it is an empowered choice. We can reflect God’s love and generous spirit to us, in how we relate to others. QUESTION Christ’s blood is all-powerful and effective, but how do we assert this? What is the balance between remembering, and speaking it out, in your tradition? PRAYER Father, we see selfishness, hatred and war all around us yet You sent Jesus to be the embodiment of your way of love and the means to achieve it. Fill us with Your love and empower us to use it to bring change to the bit of the world we can influence. Amen. To receive this every week, on the Friday of the week before the Sunday for which the readings apply, enter your email in the ‘subscribe’ box (at right, or bottom on a mobile device).